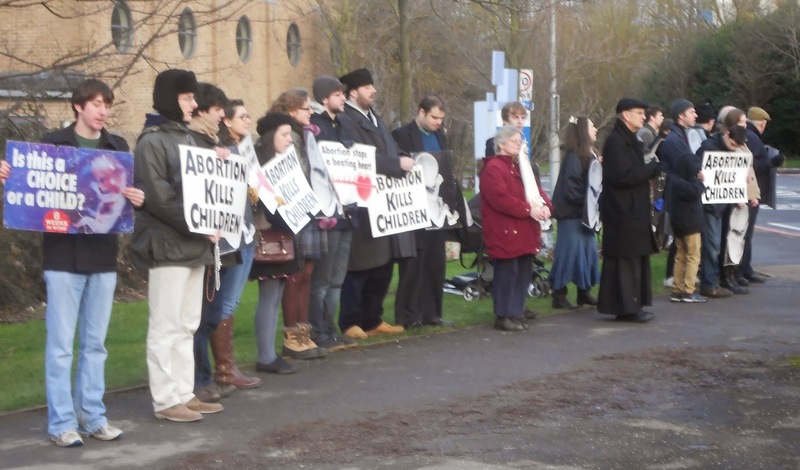 The pro-life witness in Oxford takes place one Saturday a month, for an hour, and has done so for seven years without any disruption or opposition. I go when I can. The location is outside St Anthony of Padua church, near the entrance to the John Radcliffe Hospital. The 'JR' is the only place in Oxford where abortions take place. But they don't take place, I undertand, on Saturdays, so we don't see women on their way there. It is, nevertheless, a symbolic place for us to pray. We pray the Rosary, led usually by Fr John Saward, Priest in Charge of SS Gregory & Augustine's down the road. Before we start he exposes the Blessed Sacrament in the monstrance, and some of us stay in the church to keep Him company. At the end we have a brief Benediction. Two months ago a small number of pro-abortionists turned up to join us. They stood on one side of us. Last month there were more of them; our numbers were also good and we outnumbered them by nearly 10 to one. Yesterday, more of them came, seven in all - still not very many - but much more aggressive. Here's an eyewitness account. "Today as we went to take up our positions, with the Most Blessed Sacrament next door inside the Church, there approached 7 volatile, jeering, almost demonic pro-death people. They had made more home made banners and came and stood in front of us and interspersed themselves between us all. They brought out two large (dirty) sheets and held them in front of us and stood jostling with pro-lifers so that they were standing in front of us and hiding our posters. They had tasteless music blaring, were dancing, wiggling their hips, acting like the devil incarnate. It had a very diabolical feel to it to be honest. "We were most definitely hounded today but one could hear the beauty of the Rosary - especially when all those able bodied knelt for the the Crucifixion mystery - which they especially loathed- ringing out and reaching the ears of God. This is what it normally looks like. "We did call the police who tried to diffuse the situation and have offered us sound advice for next time which will allow us to remain protected and safe. I suppose in many ways having such protesters only shows the magnitude of the truth, the pro life message reaching their hearts and souls and which will, please God, one day affect them and change their beliefs." O Lady of Guadalupe, pray for us! And most of all, for them. The group at Maidstone had trouble last spring or summer when a man threw a bucket of liquid over the priest and others. The group there is steady, going weekly, but very small. When I did this in the States, we had pacifist training, which I think everyone in the pro-life groups should get. Such techniques as how not to respond to anger, spitting and also how to diffuse nastiness are good tools,but to be learned.